Steiner's Solar Services is Sacramento's elite solar installer providing one goal, "to ensure the complete satisfaction of every customer, while offering knowledgeable and friendly service at competitive rates." Our hope is that you will feel confident in our ability to meet all of your expectations and know that our customers are always our number one focus. Our commitment to providing our customers with the highest quality solar electric services and products at affordable rates is what makes Steiner’s Solar Service the obvious choice to meet your needs. 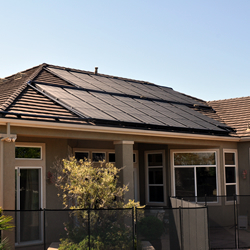 Steiner Solar is an experienced Sacramento solar installer. We can install solar panels on many types of roofs or on a pole. We have innovative techniques that will help collect the maximum amount of sunlight to convert into energy for your home, business or agricultural buildings. For most of our customers, the roof is the most optimal location for your solar panel system installation. The roof is already structurally sound enough to carry the weight of the solar panels and mounting hardware. Give Steiner's Solar Services today at (916) 681-5872 or (916) 966-1325 to see how affordable a solar electric system for your home or business can be. Steiner Solar is a solar electric company and contractor in California cities including: Antelope, Carmichael, Citrus Heights, Courtland, Davis, El Dorado Hills, Elk Grove, Elverta, Fair Oaks, Folsom, Galt, Gold River, Granite Bay, Herald, Hood, Isleton, Loomis, North Highlands, North Sacramento, Orangevale, Rancho Cordova, Rancho Murieta, Rio Linda, Rocklin, Sacramento, South Sacramento, Vacaville, Walnut Grove, West Sacramento, Wilton, and Woodland.